What a heatwave! It’s August in southern California and we have been battling the heat of 100* plus temperatures lately. While we wish to escape to the beach or take a dip in a cool pool, scorpions are also looking to escape the insanely high summer temperatures. Although active at night, these nocturnal insects can sometimes enter homes through tiny cracks to seek shelter in cool, moist locations. The southwest Riverside county landscape has plenty of rural locations with some residences butting up right next to mountainside foothills. These rocky desert landscapes are the preferred habit for scorpions. Fortunately, AmeriGuard Pest Defense can provide scorpion pest control services to reduce scorpion populations. From what we hear, a scorpion sting feels much like a bee sting and some scorpion species can be dangerous. As a homeowner concerned about scorpions, there are steps you can take to make your backyard less inviting for scorpions to hide. These steps include: sealing small openings in and around your home’s structure, inspecting items stored outside before using them (shoes, gloves, etc. ), eliminating trash and debris to reduce hiding places and removing ornamental rocks that can be used to harbor scorpions. If you live in a rural, dry climate such as found in areas of San Jacinto, Hemet, Homeland, Menifee and Temecula, the best thing you can do for a scorpion problem is to schedule a scorpion pest control service. AmeriGuard Pest Defense will treat the foundation and cracks and crevices of the perimeter of your home, including around doors and windows. This perimeter treatment will stop scorpions in their tracks and prevent them from gaining access to your structure. 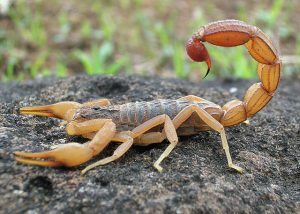 For homes that are situated in the natural scorpion habitat, it may be wise to consider keeping your home on a monthly scorpion pest control service. If scorpions have already been a problem in your landscape, then a maintenance program will guarantee that your home is protected from scorpions year round. Another thing to consider is that scorpions feed on other insects and spiders. If you have these pests in your yard, then it is more likely that scorpions will make themselves comfortable as they have access to a constant food source. A pest control service that reduces the exterior pest populations in your landscape, will go a long way in achieving greater scorpion control.